There’s an essential piece of guidance to bear in mind if you’re choosing whether or not to watch ‘Step Up: Revolution,’ the newest instalment in the ‘Step Up’ franchise. If you’re capable of taking it at face value as a dance film, you will enjoy it; if you are expecting stunning drama and Oscar worthy performances you will inevitably be left disappointed. The truth is that yes, it would be all too easy to rip apart the movie. The predictable love story between a boy and girl from different sides of the social strata, the average-at-best acting and the general cliché of the movie as a whole, all render the title of the new ‘Step Up’ film something of a misnomer: there is nothingrevolutionary about ‘Step Up 4: Revolution’. However, the ‘Romeo and Juliet’ formula has timeless appeal for a reason and we’re under no illusions that the film aims to impress in any arena other than dancing. If the plot’s periphery and even if the performances are wooden, the moves are certainly not. 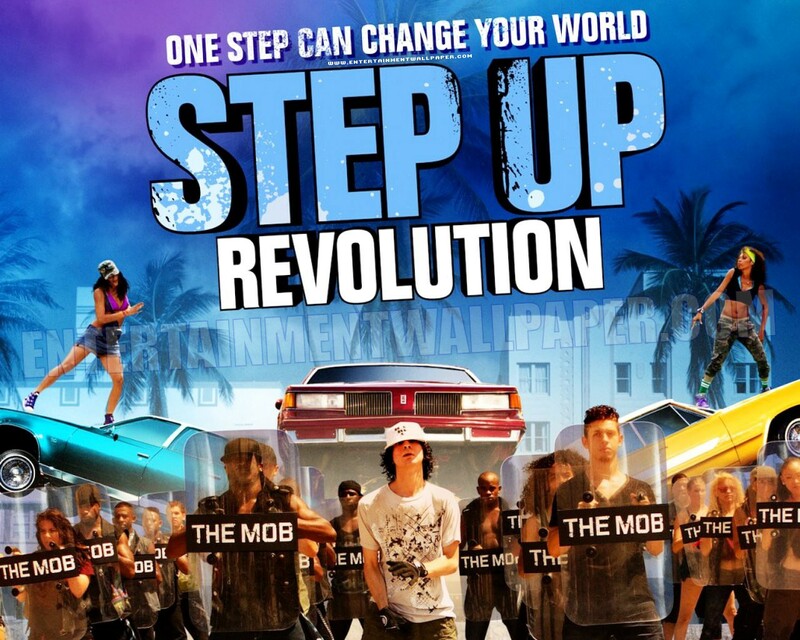 Set against the backdrop of sunny and sultry Miami, (an excuse for lots of bikinis and tousled hair), the movie concentrates on an underground flash mob known imaginatively as “The Mob.” Led by childhood friends Sean and Eddy, the group are trying to win a YouTube contest to garner as much publicity as possible as well as one million dollars. Sean (Ryan Guzman) works as a waiter at a hotel owned by ruthless boss, Mr Anderson, who is planning to bulldoze The Mob’s neighborhood and replace it with an enormous commercial development. Sean connects with Anderson’s aspiring dancer daughter Emily, (Kathryn McCormick), at a club and they begin a romance. Sean encourages Emily to “break the rules” and add originality to her otherwise faultless technique, so he recruits her into The Mob. This is both Guzman and McCormick’s feature film debut and from the outset it’s clear that they are very much dancers rather than actors. Their stilted attempts at dialogue actually elicited embarrassed laughs from the audience. It’s a definite step down from the sizzling spark between Channing Tatum and Jenna Dewan in the first film in the franchise. However, Guzman and McCormick’s chemistry does creep to the surface when they dance. Emily’s evocatively fluid contemporary dance and Sean’s jarred urban style are choreographed to create a beautiful blend even if it does make us wish we could just watch them dance for an hour and a half and simply leave out the acting. The plus side is that dancing does take up the majority of the 97 minutes of running time. When Emily visits Sean’s neighborhood she realizes how much will be lost if her father’s plans are approved and she suggests The Mob transform their performance art into “protest art.” This is the movie’s attempt at a pseudo-political message about anti-consumerism but it dissolves into the background as the focus falls on the flash mobs. Their routines deliver hypnotic eye candy. One takes place in an art gallery and prompts interesting ideas on the intermingling of different art forms as static fine art literally comes to life. (If you’re familiar with the music video to Gotye’s ‘Somebody That I Used to Know’ you can’t help but find this scene reminiscent of it). In another impeccable sequence, the troupe mingles within a crowd of businessmen at a Council meeting and their synchronized movements seem to be a dig at the faceless and emotionless world of consumerism. How much of this is intentional is unclear. The blend of dance styles ranging from hip-hop and contemporary dance to aerodynamic gimmicks makes for exciting viewing even if it’s all a little disjointed. The storyline doesn’t attempt to draw you in and be compelling; it’s the dancing that’s the primary attraction. And really that’s the ultimate aim.